Tech stocks had been leading the overall stock market this year (i.e. FANG). However, the NASDAQ’s good fortune has reversed recently, with the NASDAQ now below its 50 daily moving average. The NASDAQ has now fallen 1%+ 3 days in a row. What’s surprising is that while the NASDAQ has fallen 1%+ 3 days in a row, the S&P 500 hasn’t fallen 1%+ on any of these days. In other words, the NASDAQ has significantly underperformed the S&P 500. Here’s what happens next when the NASDAQ falls 1%+ 3 days in a row while the S&P doesn’t fall 1%+ on any of these days. As you can see, the NASDAQ tends to make a short term bounce in the next 1-2 weeks. What happens after that is a 50-50 bet. As you can see, the S&P tends to make a short term bounce in the next 1-2 weeks. What happens after that is a 50-50 bet. But here’s the really interesting study. What happens next to the NASDAQ:S&P ratio when this signal gets triggered. 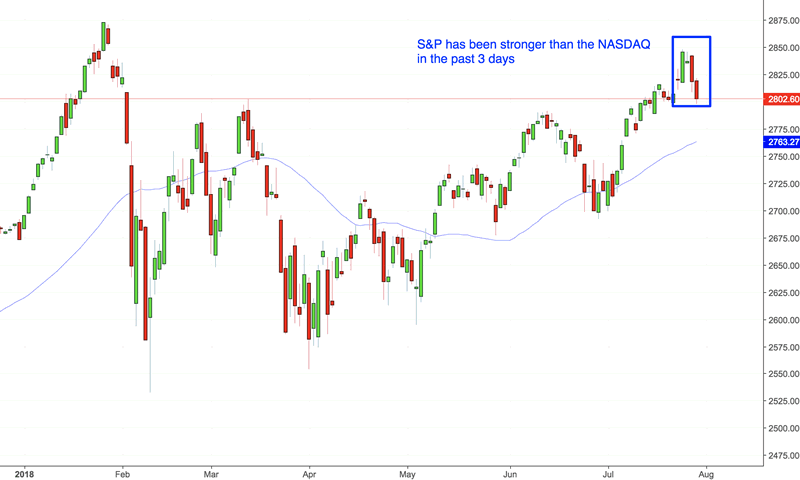 A rising ratio means that the NASDAQ will outperform the S&P. 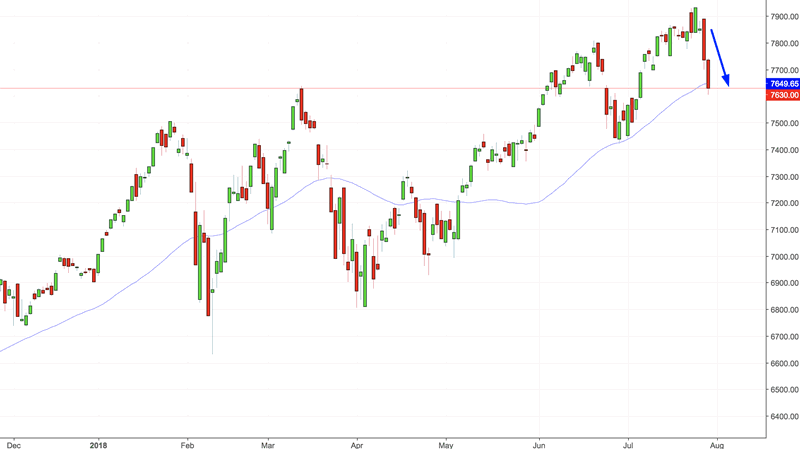 A falling ratio means that the NASDAQ will underperform the S&P. As you can see, the NASDAQ tends to outperform during the short term while it makes a short term bounce, but it tends to underperform in the medium-long term. This suggests that for the remainder of this bull market, the NASDAQ and FANG stocks will not significantly outperform the S&P 500. Last week we published a study which demonstrated that the stock market leaned bearish in the short term. With the stock market having already made a pullback, it looks like the stock market’s short term downside is limited. This study doesn’t tell you if the market will go up or down in the medium-long term. But it does suggest that the NASDAQ will not significantly outperform the S&P 500 like it did over the past year.